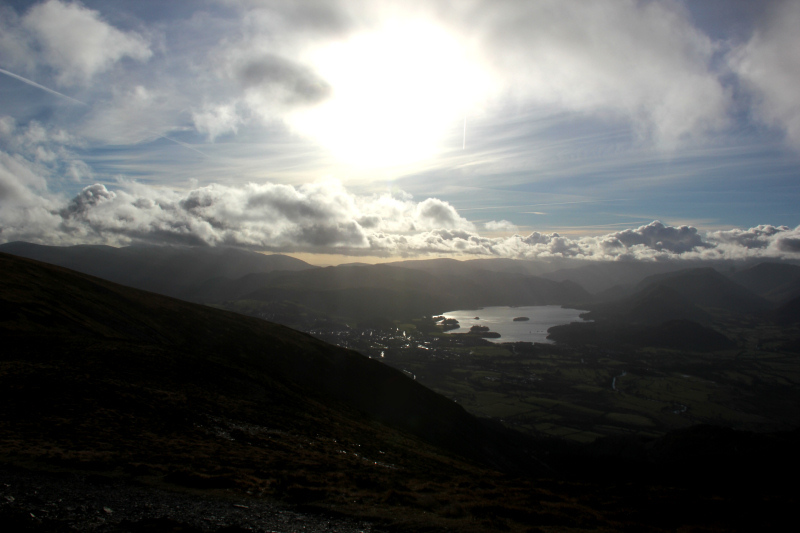 On looking out the window this morning the weather looked fairly good, so I set off to ascend Skiddaw. 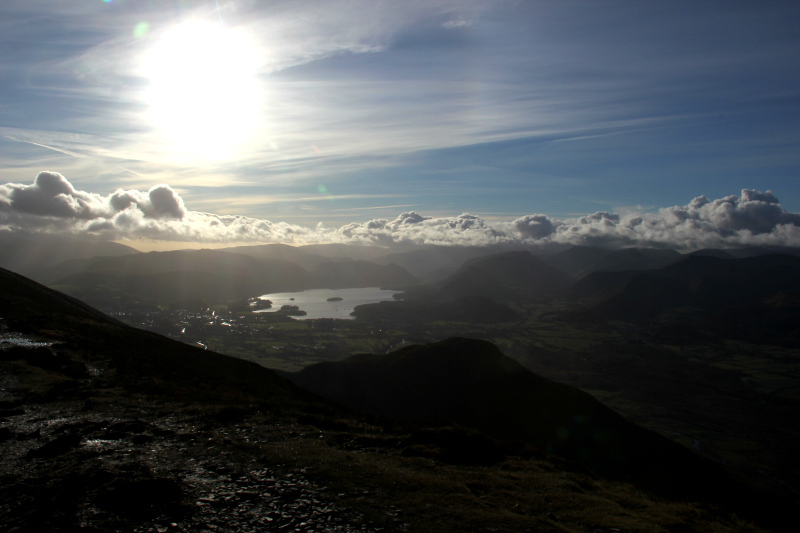 Prior to coming to the Lakes, I had been advised that the nicest ascent of Skiddaw was via Ullock Pike. 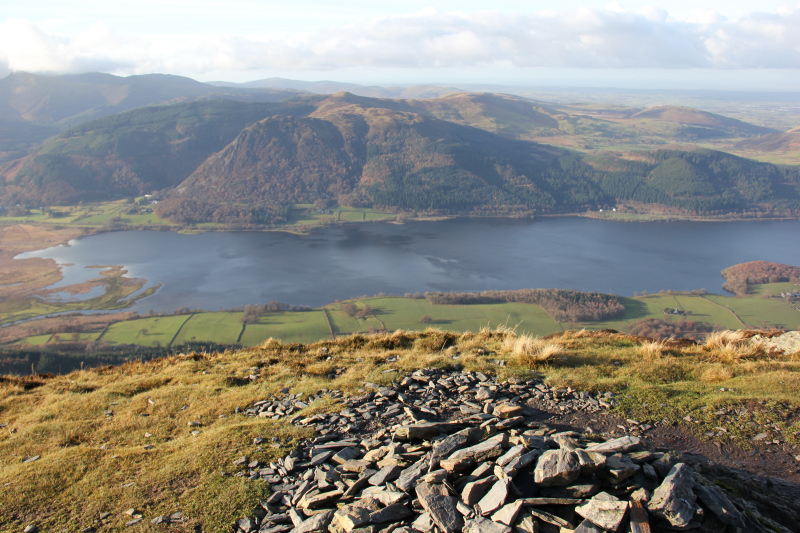 A bit of research on the internet found me the ideal starting point for an ascent via Ullock Pike – a large lay-by at NY236310 located next to an access path. 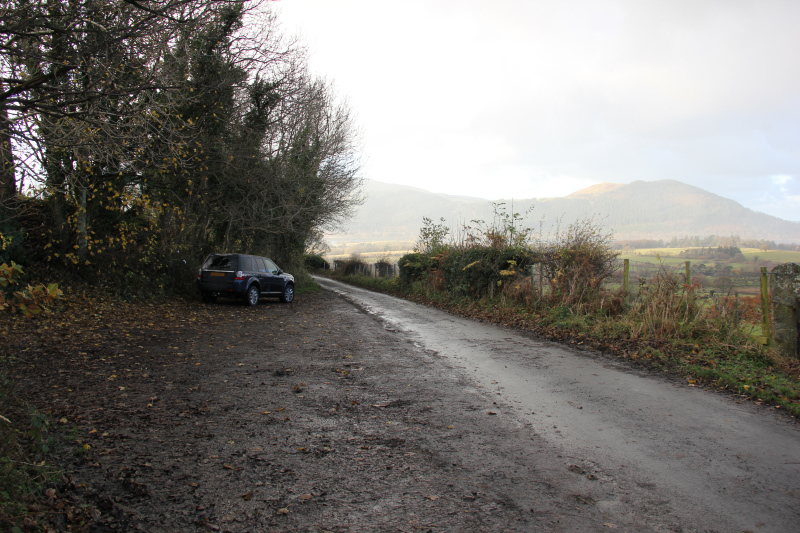 I was a bit worried that all the spaces would be taken by the time I got there but was happy to find that I was the first car there . 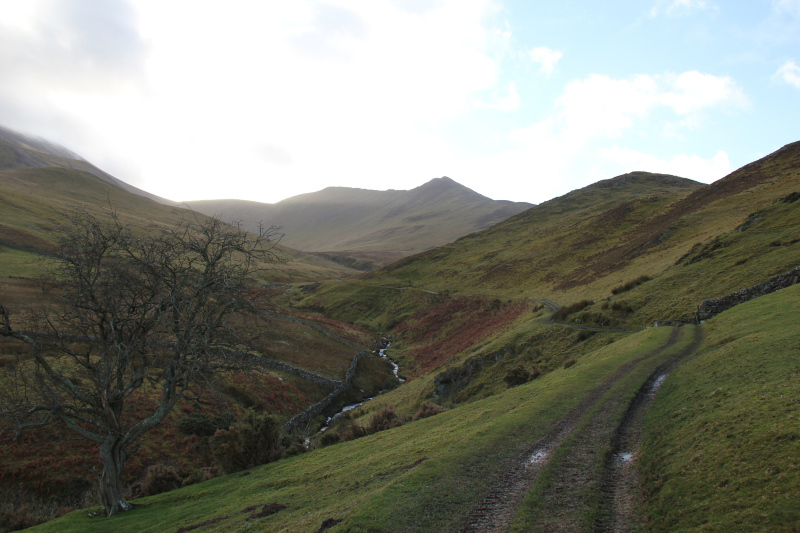 From the lay-by, I set off along a very muddy track through a field of sheep. 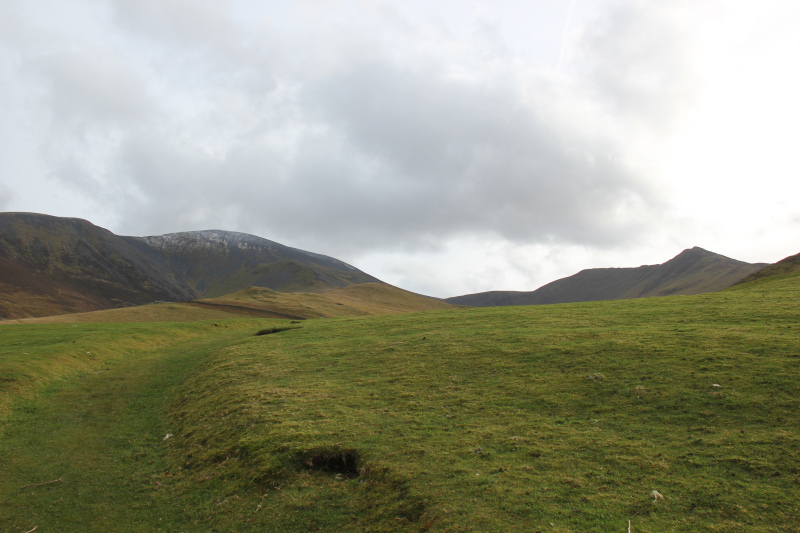 After passing through a couple of gates, I followed an excellent grassy track towards Ullock Pike. 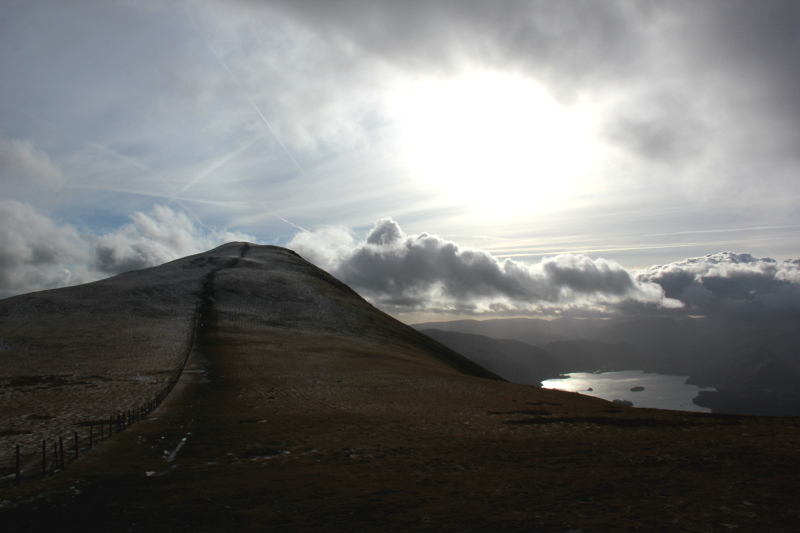 The good track made for fast progress - it didn’t take long to reach the base of Ullock Pike. 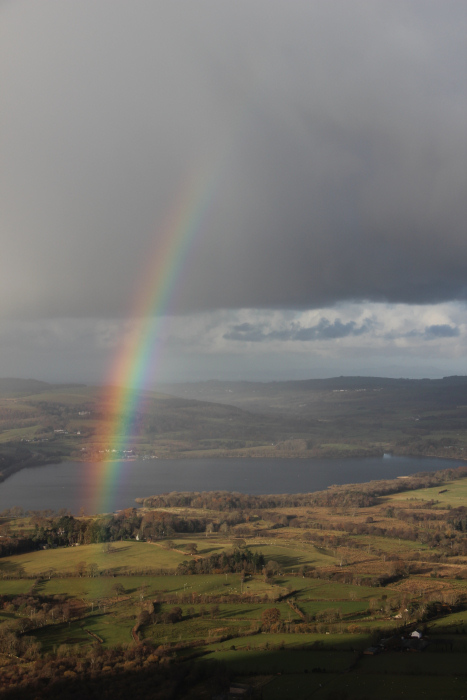 During the initial ascent there were a number of rainbows due to the mix of sun and rain. 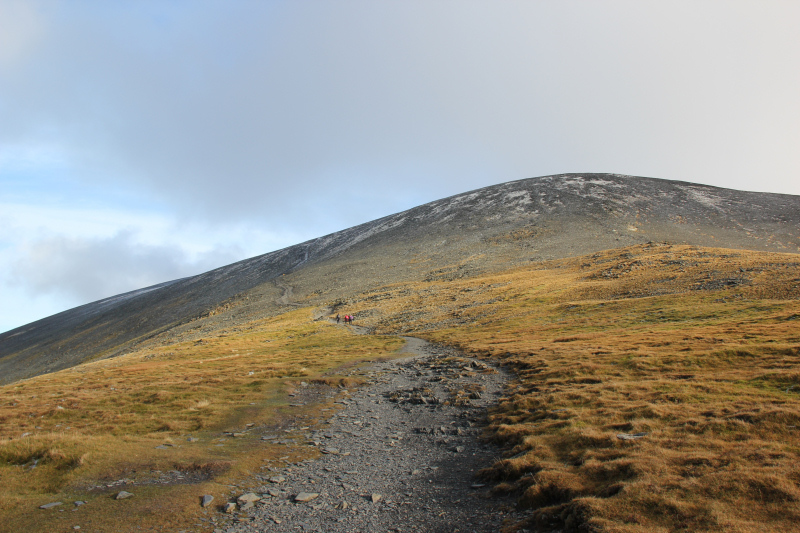 During the ascent I met another couple of walkers going in the same direction. 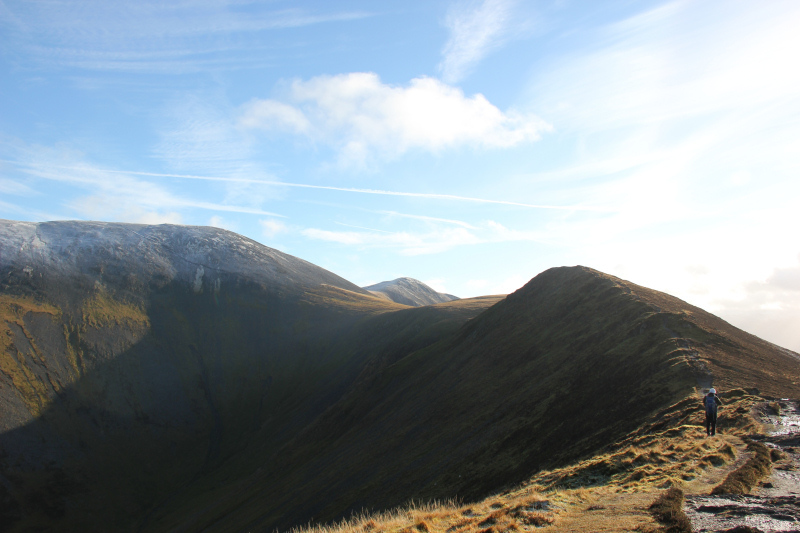 I pretty much stuck to the ridge of Ullock Pike during the ascent. 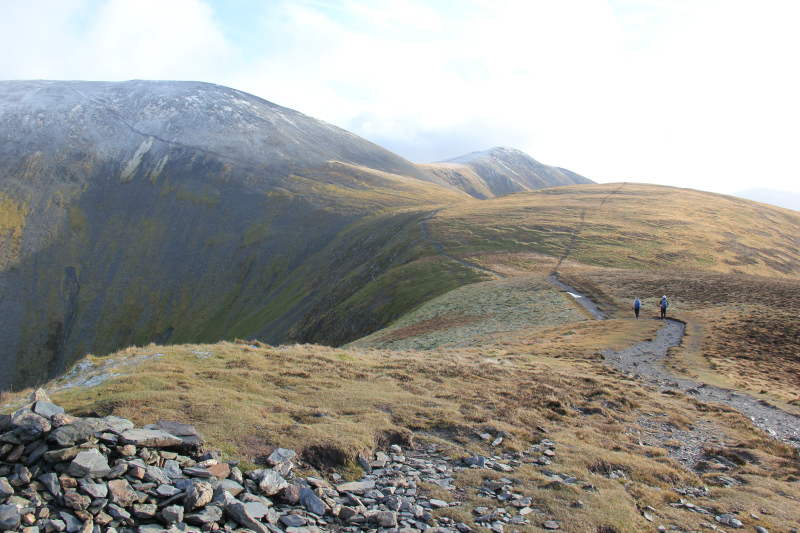 There are bypass paths around some of the rockier sections but the rockier sections are all quite straight-forward. 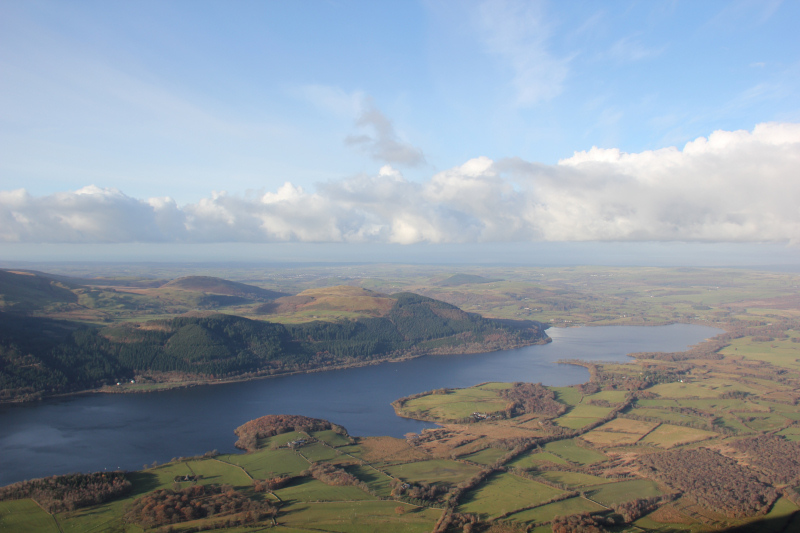 I thought Bassenthwaite Lake looked quite nice. 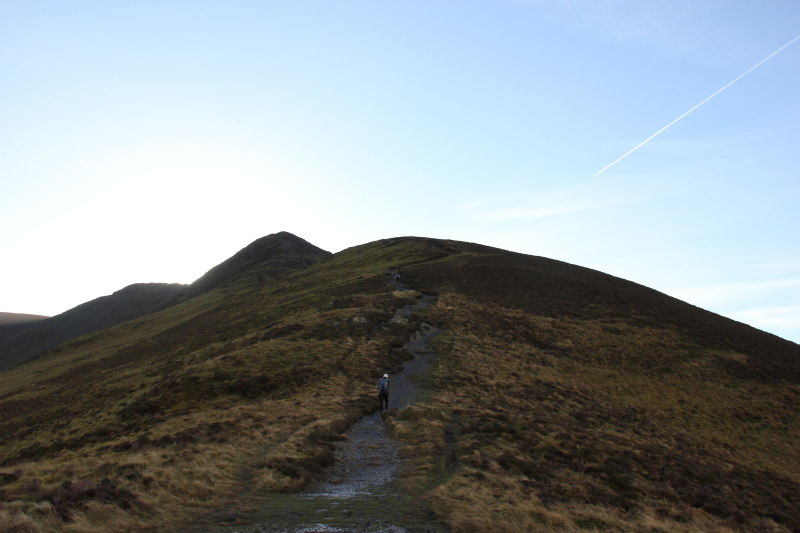 It was difficult to see where I was going during the final ascent owing to walking into strong sunlight. Photos taken into the sunlight, with the camera set on automatic, were not coming out well. 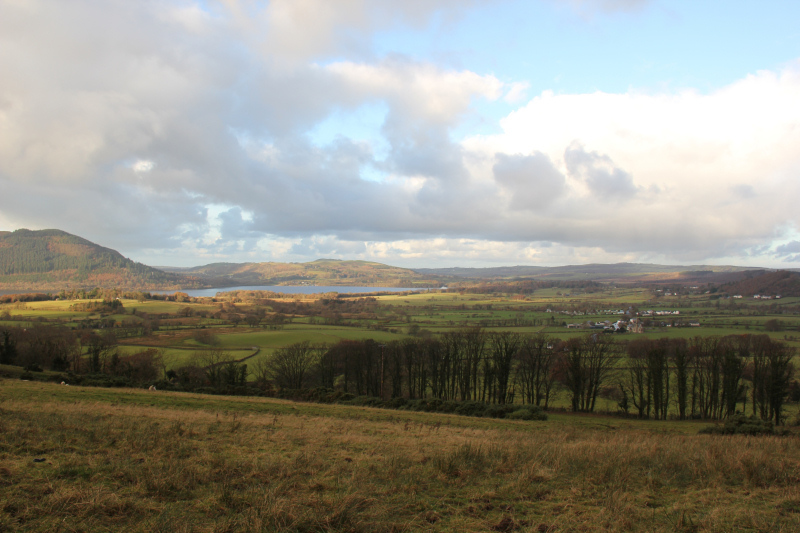 So I switched the camera to manual and with a bit of trial and error took the odd photo into the sunlight. 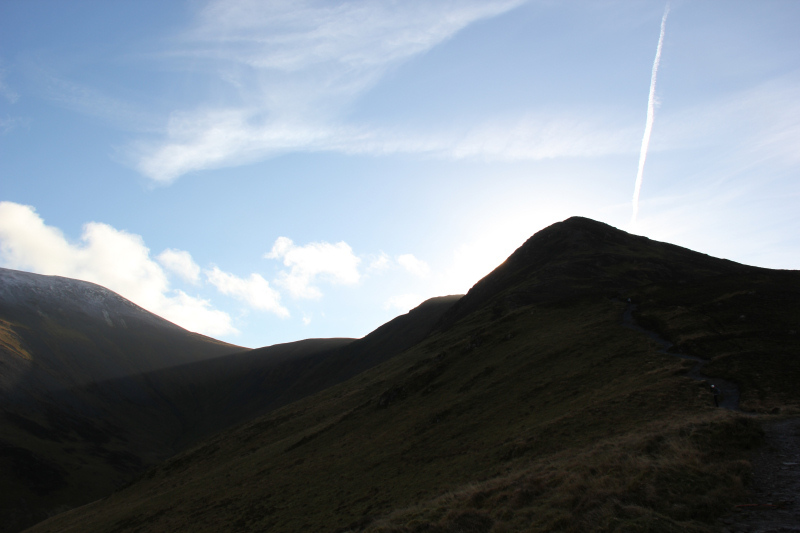 I should learn to use the camera properly! 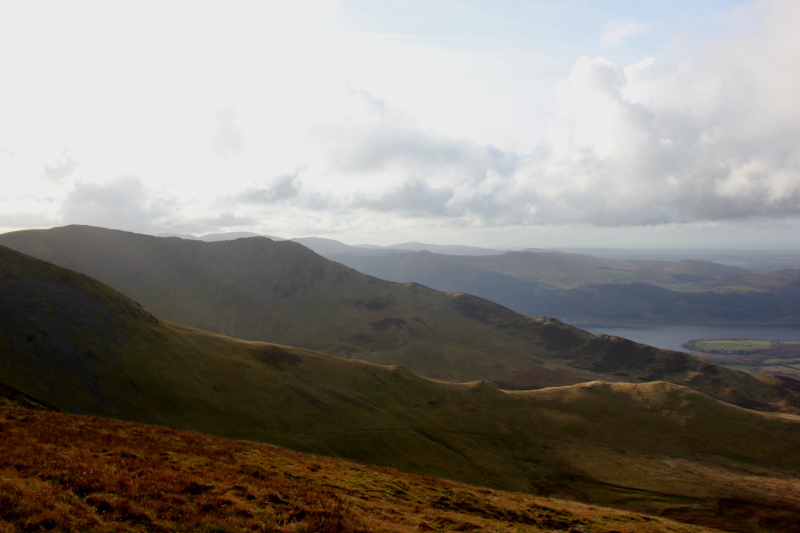 From Ullock Pike, I made my way along the ridge to Long Side. 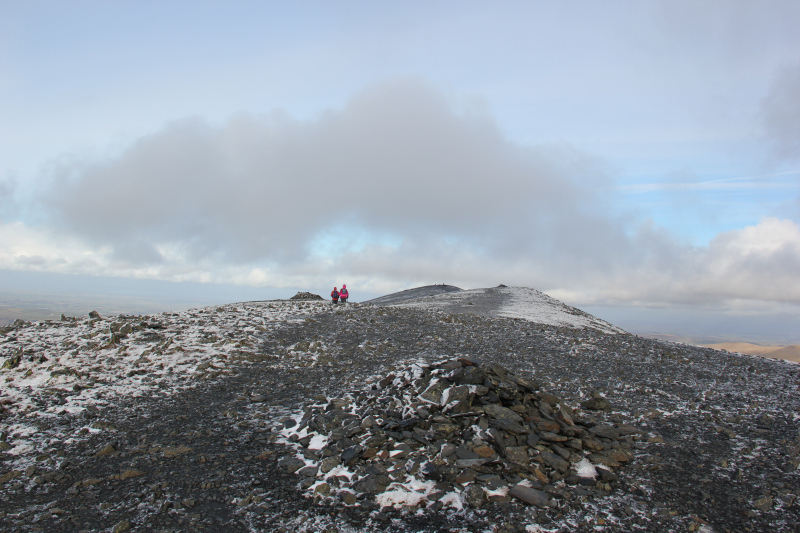 It couldn’t have taken more than five to ten minutes to reach Long Side from Ullock Pike as these Wainwrights are fairly close together. 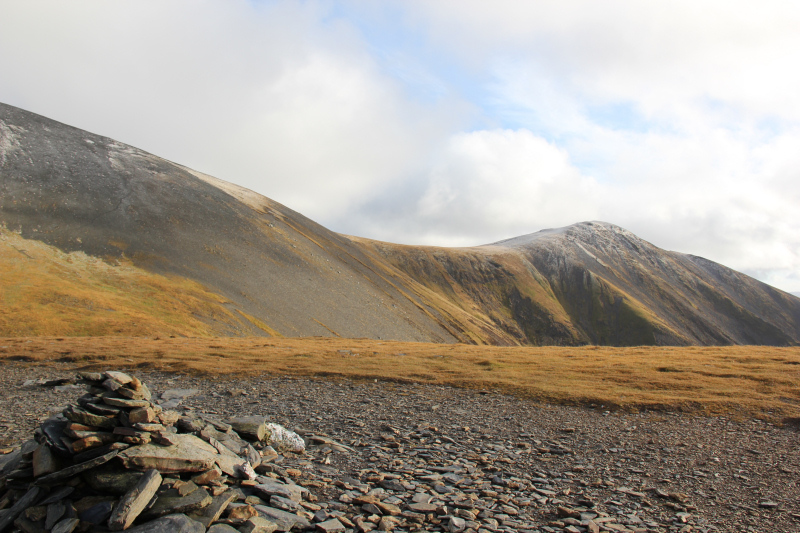 From Long Side, I descended to the col and then left the main path to ascend Carl Side. 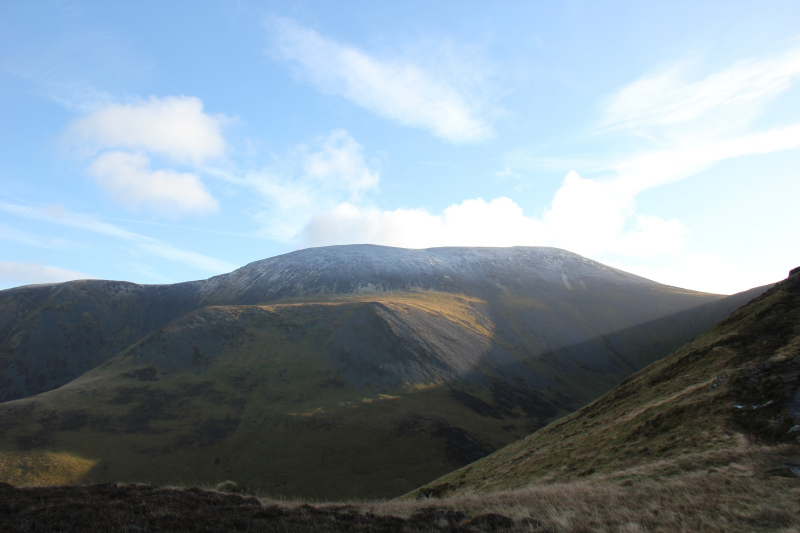 From Carl Side, I descended back to the main path and then began the steep ascent towards the summit of Skiddaw. 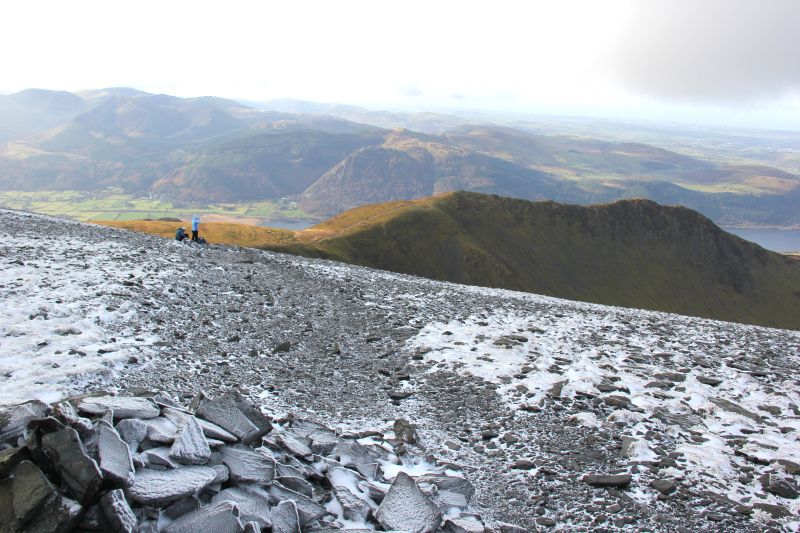 I had to stop a couple of times to catch my breath during the ascent. I blame having a cold . 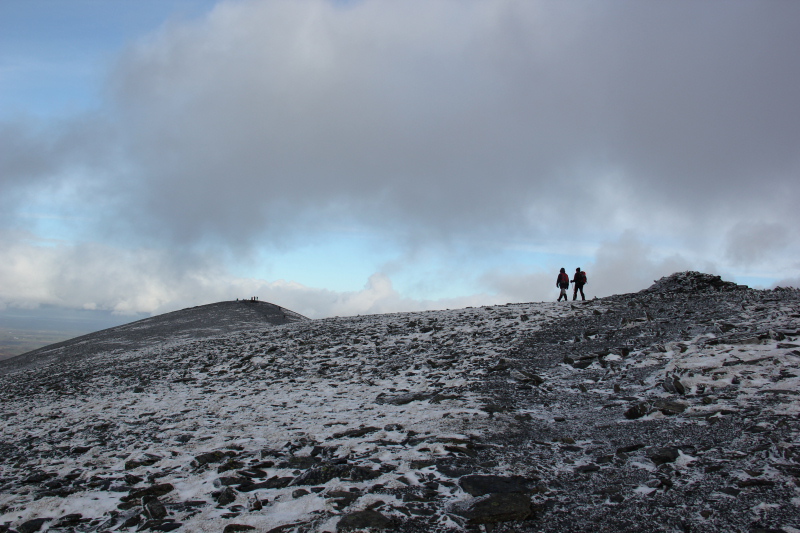 On reaching the summit plateau, I stopped to put on more layers. 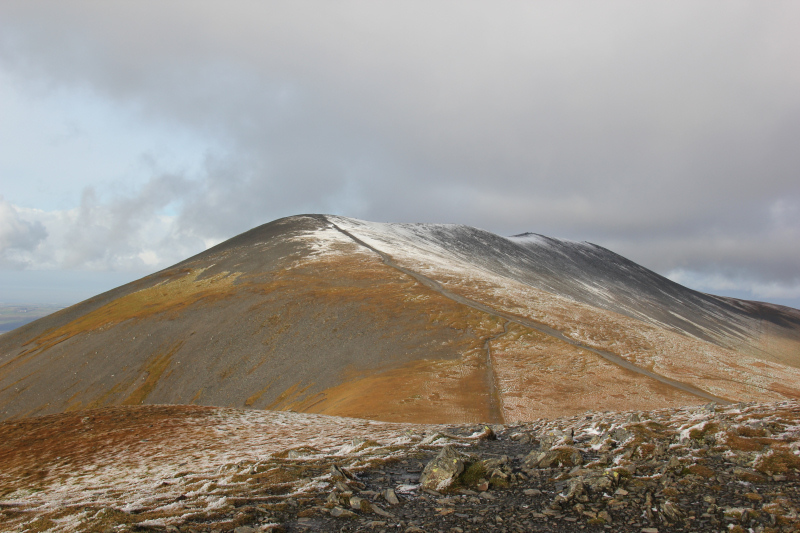 Despite the summit of Skiddaw only being a few hundred metres away, I decided to head for Skiddaw Little Man first. 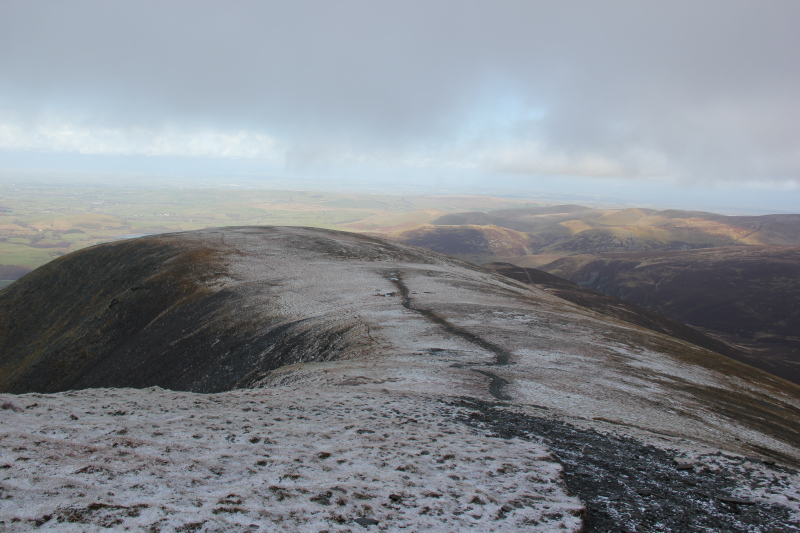 I was also tempted to ascend Lonscale Fell but decided that it was a peak too far today. 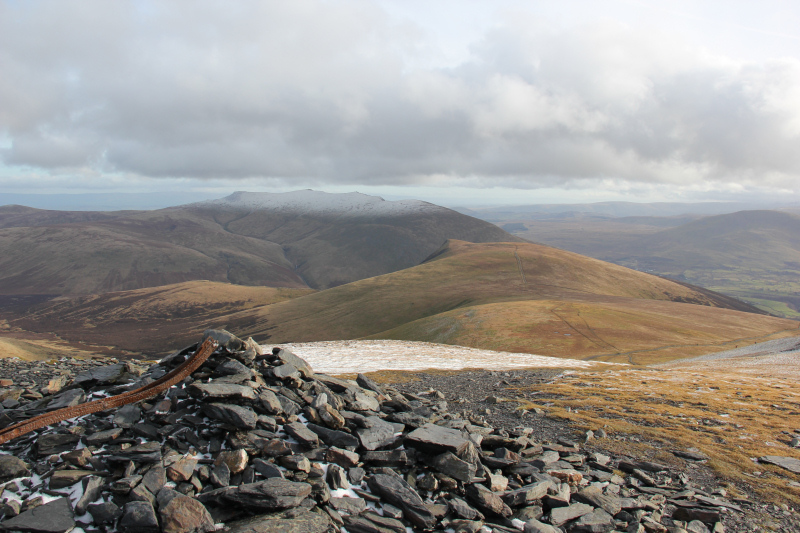 From Skiddaw Little Man, I retraced my steps back towards Skiddaw. 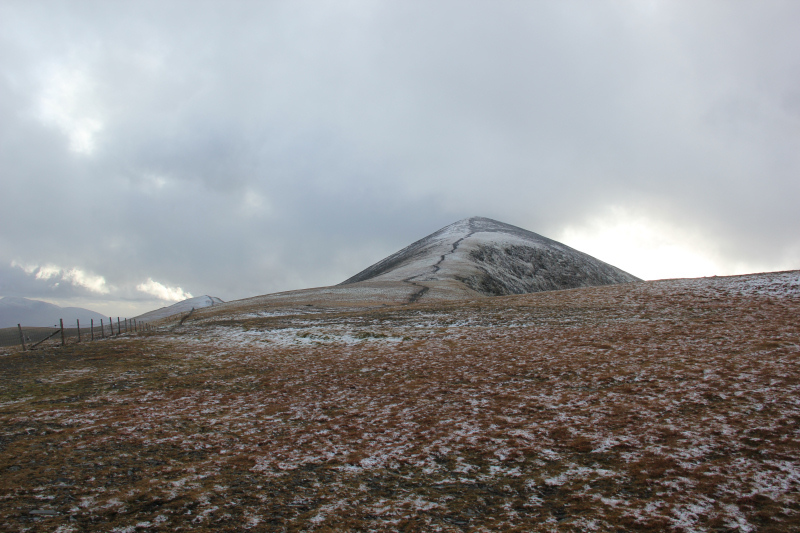 It was fairly cold up on the plateau, so I didn’t spend too long up there. 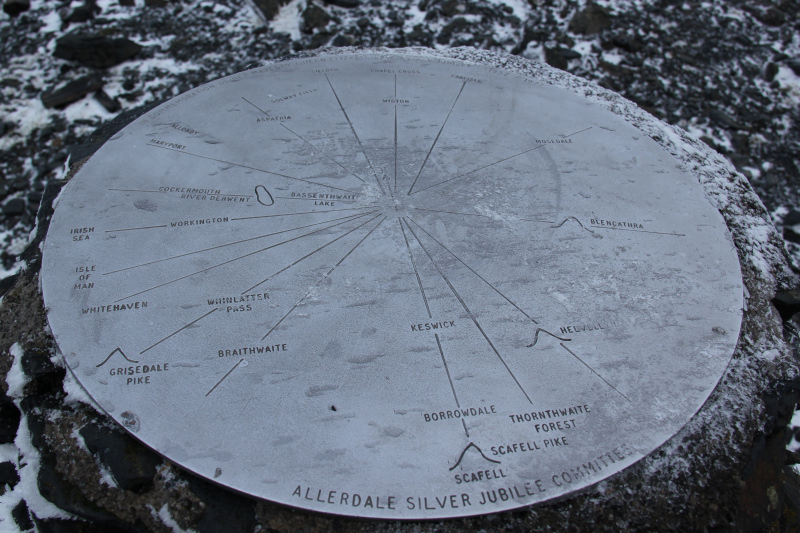 After a quick look at the toposcope and a check of the map in the shelter, I was on my way. 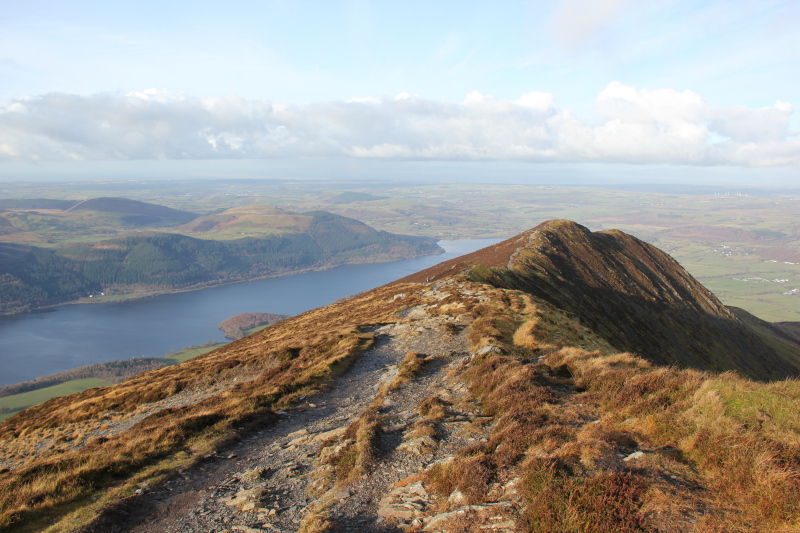 I descended Skiddaw towards Broad End and then followed the path to Bassenthwaite Common. 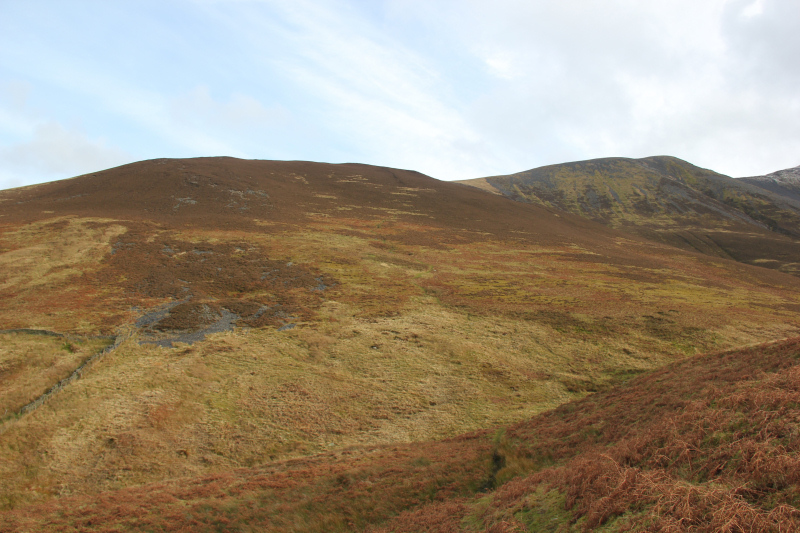 During the descent, I ended up following a direct path down the hillside that was not marked on the map. 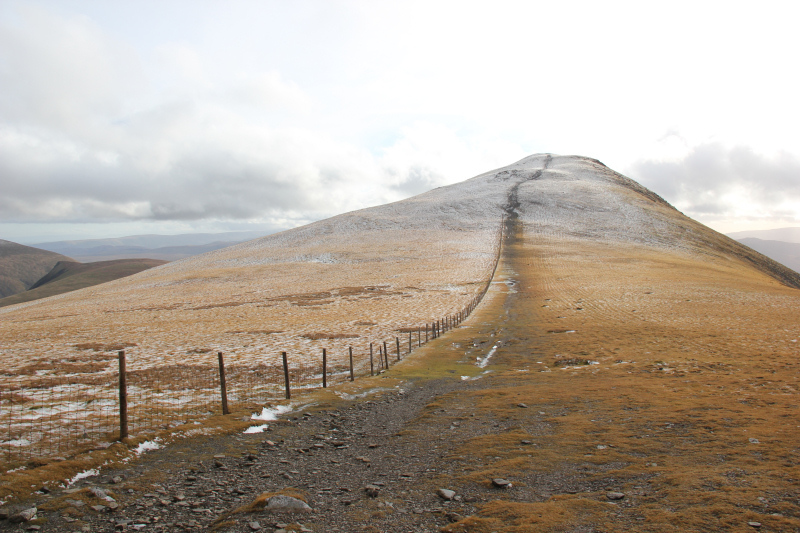 It was fairly steep but much shorter than the path marked on the map. 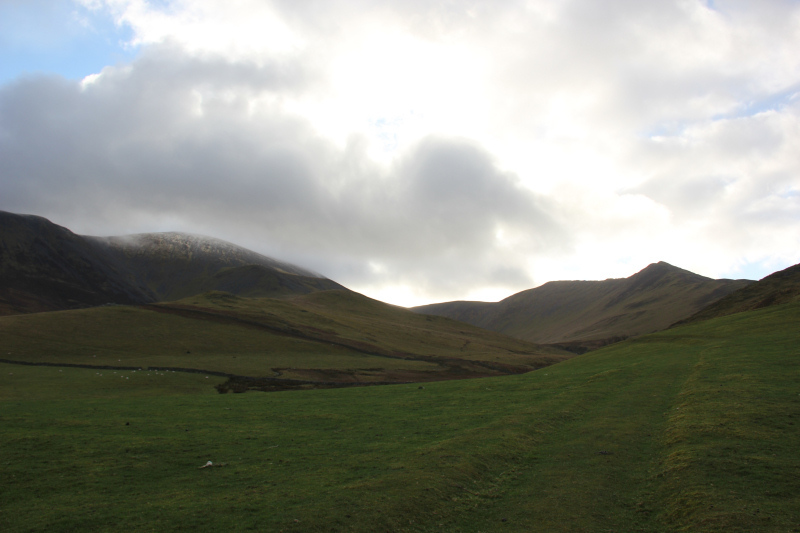 I eventually arrived back to the track that I had used that morning and followed it back out to the car. 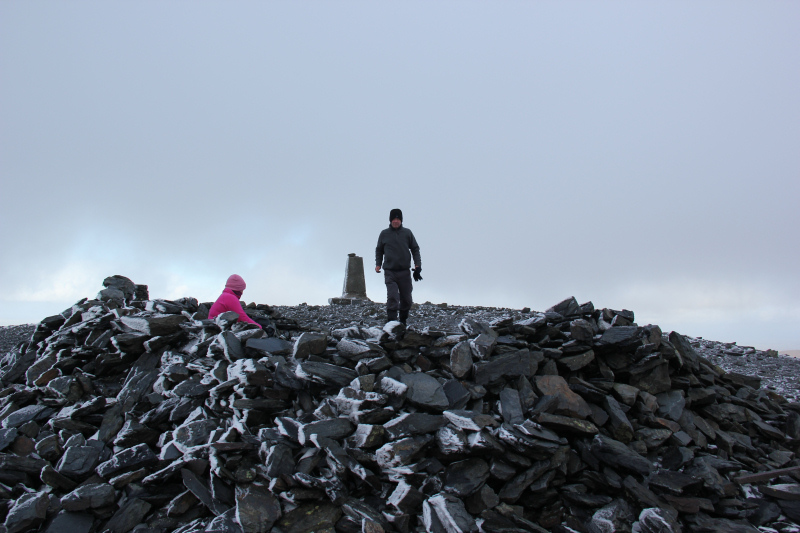 A really enjoyable day out .